Chicken Barley Soup is deliciously simple. 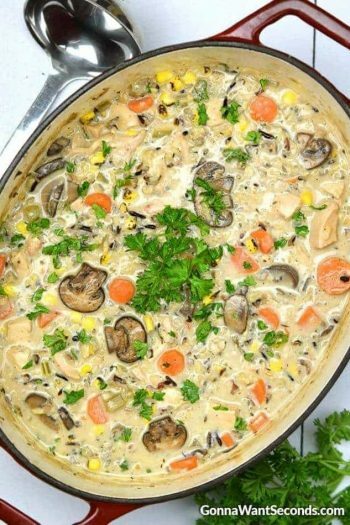 Tender chunks of chicken, barley and vegetables in a flavorful broth! Serve this belly-warming soup recipe with 30 Minute Dinner Rolls and a side salad for a perfect meal any time of year! Chicken Barley Soup is the dish my grandma used to make. 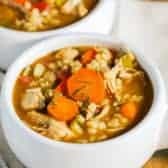 While we most frequently have Beef Barley Soup, this I do love the flavor of a rich chicken barley soup recipe as well! 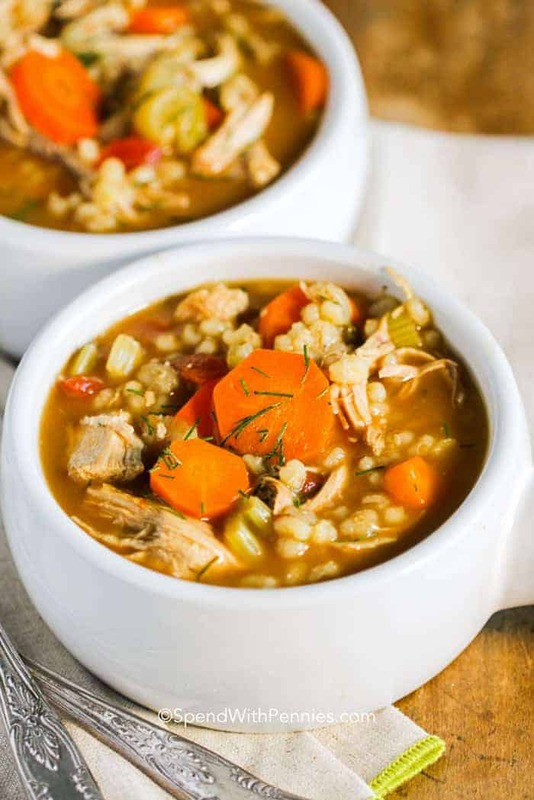 Carrots, celery, chicken, tomatoes, and of course barley are all simmered in chicken broth to create this comfort food classic. I love making soup almost as much as I love eating (or slurping) it. Chicken noodle soup, split pea soup… you name it, I am there. 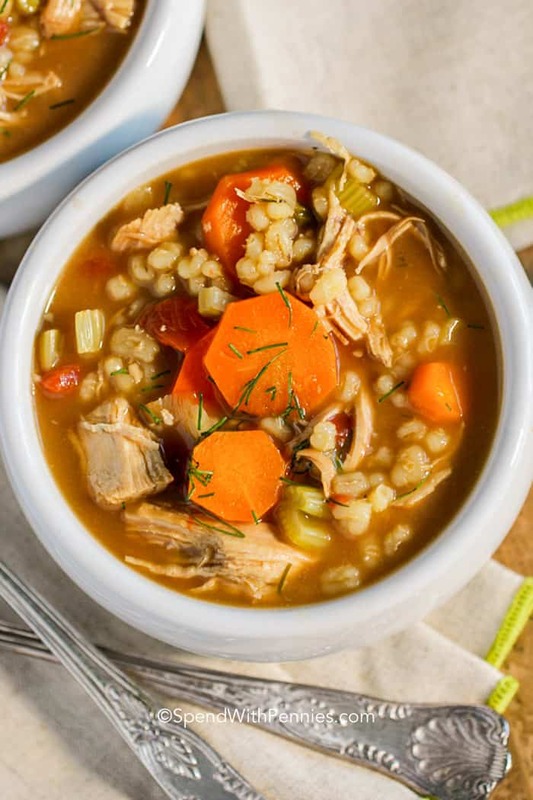 This chicken barley soup recipe is no exception. It is so mouthwatering, and actually good for you! 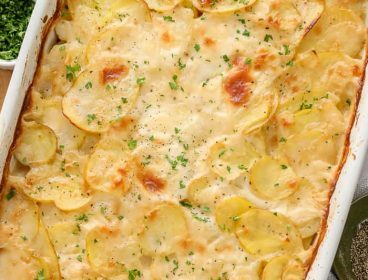 What’s better than guilt-free comfort food? Nothing. This easy soup recipe freezes perfectly and reheats super quickly, making it perfect for lunches or an impromptu dinner! When we make this soup, you should make sure your chicken is cooked before adding it in. 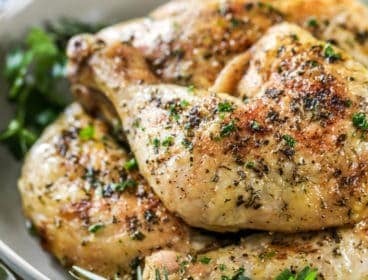 It’s a great opportunity to use up leftover chicken, or to quickly make some poached chicken or rotisserie chicken in this recipe.. Easy and flavorful! When you make chicken barley soup, make sure you don’t add the fresh herbs right away. If you add them in the beginning, they will overcook. so stirring them in right at the end of cooking is the best option. Unless it is simmered for awhile, barley is crunchy. No one likes crunchy in their soup! This recipe uses pearl barley, which is the most common type of barley. It is a small grain, with a chewy texture and slightly nutty flavor. At the very minimum, pearl barley takes about 25 minutes of simmering on the stovetop. 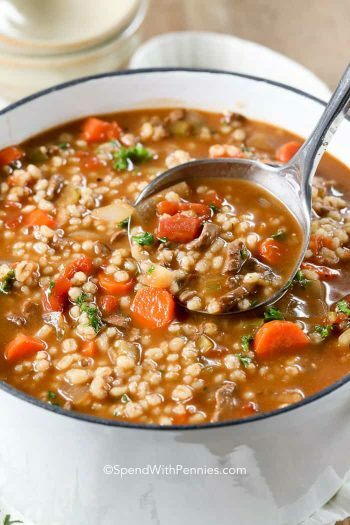 Barley is very hard to overcook, so don’t worry about simmering your soup for longer! We simmer this chicken barley soup for about an hour which I find is the perfect time to combine and intensify all the flavors! I think soup is the perfect fall food! It’s easy to make, naturally pretty healthy and it just warms you from the inside out! Chicken barley is one of our favorites, this one is jam-packed with all kinds of goodies. The fresh herbs in this soup are optional but the fresh dill really adds something special to this dish so if it’s available I’d strongly recommend it! 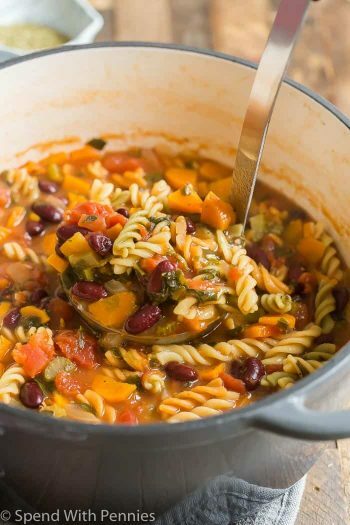 As with most soup recipes, leftovers are completely delicious so this is the perfect soup to make on the weekend and pack for lunches all week! Turkey Soup – Great for leftovers! 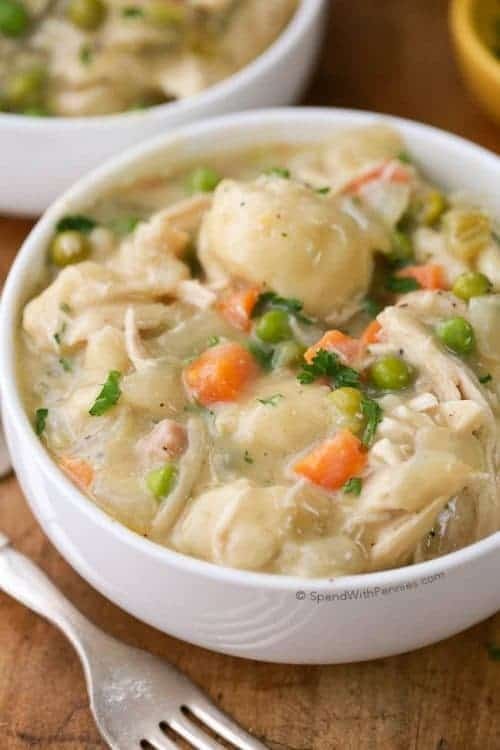 Crockpot Chicken Noodle Soup – Simply classic. 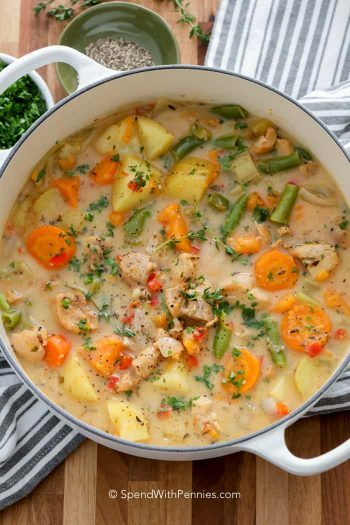 Lemon Chicken Soup – Comforting and delicious! 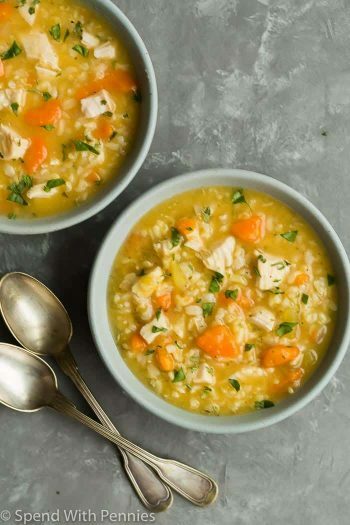 Chicken Barley Soup is easy to make, naturally pretty healthy and it just warms you from the inside out! Heat olive oil over medium heat in a large pot. Add onion & garlic and cook until slightly softened. Add remaining ingredients except fresh herbs. Bring to a boil and let simmer uncovered for 1 hour or until barley is tender. Discard bay leaves and stir in fresh herbs. Do you use raw chicken or do I cook the chicken first and add it once cooked? 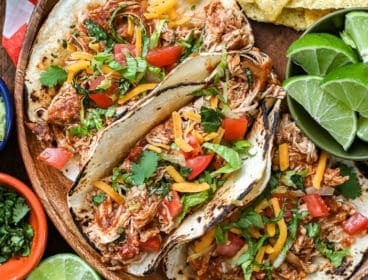 I want to try this recipe with my instant pot. 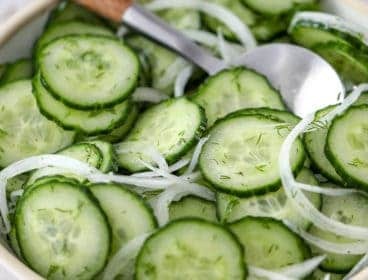 Do you know how to convert this to a instant pot recipe? This recipe calls for cooked chicken (I used poached chicken, shredded chicken or leftovers). I went rogue and it turned out amazing! We had leftover beef stew with carrots and potatoes. I chopped up the onion a bit more, cut the carrots into coins and cut the potatoes smaller. I omitted the gravy packet and used the beef stew gravy. Oh wow! This was such a hearty meal and no one knew it was leftovers. Thank you for sharing Kim! Sounds great! 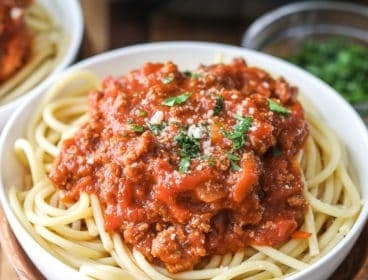 This is a great recipe, thanks! I added 3 pieces of chopped up cooked bacon and it added a nice smokiness to the soup. So glad you loved it Jennifer, that sounds like a great addition! I just made this! It was fantastic! I used Rotell tomatoes but other than that I followed the recipe! We will be making this again and plan on trying it using turkey! Glad you love the soup. Great idea to try it with turkey! Made this tonight. Everyone loved it! This recipe’s a keeper that I’ll make again and again. Thank you! Glad your crew loved it Katie! Thank you, so glad you loved it! Made this chicken barley soup today….just simply amazing. Absolutely perfection in a soup bowl. Made it exact per recipe, seasonings are spot on. Topped mine with a bit of grated Parmesan. Everyone loved it. Thank you. So happy I found your recipes. 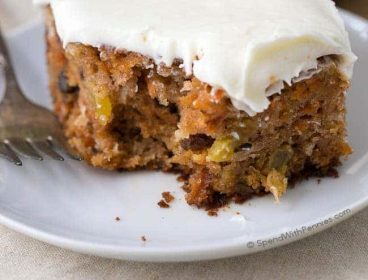 I made your banana bread the other day and it was the best ever, so moist. So happy I had those 3 leftover bananas so that I found you! I am so glad you loved it Margaret, parmesan is a great addition! I am so glad you loved the banana bread too! Looks so good need to try it for sure, beef barley as well. It will freeze well and for a couple of months. Glad you loved it! Hello , I was wondering if you had any nutritional facts for this recipe? Per Serving? I am doing weight watchers do you know how many smart points of nutritional values? I’m sorry, I am not sure how many smartpoints this recipe is. This recipe makes 6 servings so you can enter the information into WW and they will give you the points. do you know the amount of servings in the recipe? Looks great! I love Barley soups. Do you think it can be made in a slow cooker? 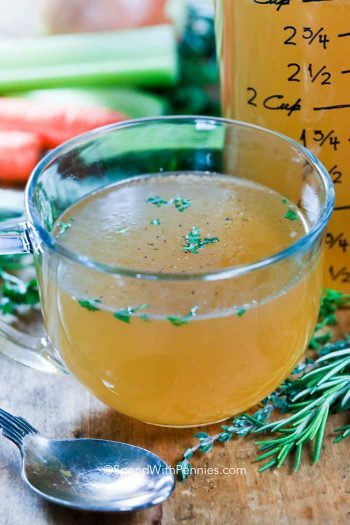 I know to add any dried herbs in the end but would I lower the amount of broth? I do think this would work in the slow cooker. Of course you will need to adjust the cooking time. I would add any dried herbs in the beginning and fresh herbs at the end.